Some time ago, I ran a very (very!) short-lived tumblr called There’s a Rule for That in which I posted unusual and/or ridiculous rules I came across in roleplaying (and other) games. I hadn’t thought about that for a while, but after coming across this gem, I’m officially reviving this as an every-now-and-then series here on the blog. 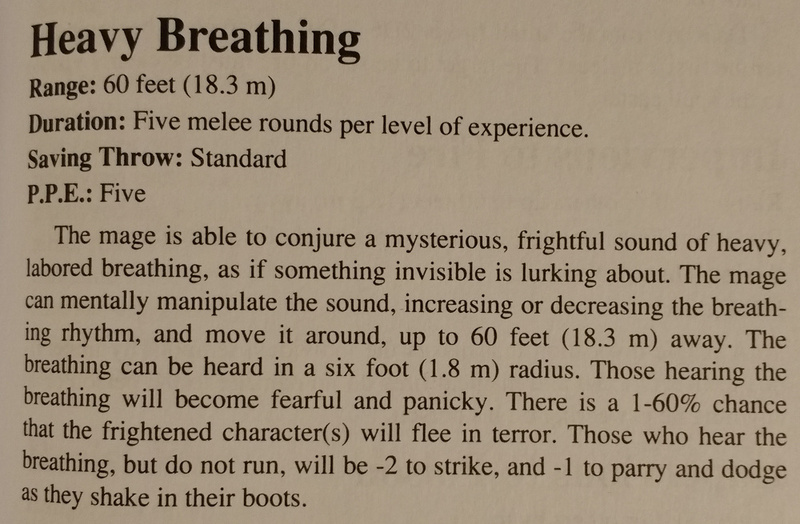 Source: Palladium Fantasy Role-Playing Game, 2nd Edition, p. 191. It’s a second-level wizard spell. If they had just called this Spectral Sound or something, it would (well, might) be possible to not giggle.